SrIperumbUthUr – Ani magam, Friday (yesterday) – http://sriperumbuthur.blogspot.com/2016/07/july-2016-week-2.html . SrIvillipuththUr – periyAzhwAr thirunakshathra mahOthsavam day 5 (yesterday) – http://srivilliputhur.koyil.org/?p=508 . bhagavath gIthA – 2nd chapter, 6th SlOkam added in http://githa.koyil.org/index.php/chapter-2/ based on http://githa.koyil.org/index.php/chapter-2-original/ . guru paramaparai – vaduga nambi – life and glories in thamizh – https://guruparamparaitamil.wordpress.com/2016/07/08/vaduga-nambi/ based on http://guruparamparai.wordpress.com/2013/04/01/vaduga-nambi/ – new article by sadagopan swamy . Please visit https://guruparamparaitamil.wordpress.com/2015/03/14/introduction-2/ to see the full list. thiruvAimozhi 3.1.2 – katturaikkil – http://divyaprabandham.koyil.org/index.php/2016/07/thiruvaimozhi-3-1-2-katturaikkil/ – English translation. Full series can be viewed at http://divyaprabandham.koyil.org/index.php/thiruvaimozhi/ . SaraNAgathi gadhyam – English e-book link available at http://divyaprabandham.koyil.org/index.php/2015/11/saranagathi-gadhyam/ and http://divyaprabandham.koyil.org/index.php/e-books/ . Thanks to parAsara (pradeep) swamy for preparing the e-book. SrIperumbUthUr – Ani Ayilyam (yesterday) – http://sriperumbuthur.blogspot.com/2016/07/july-2016-week-2.html . 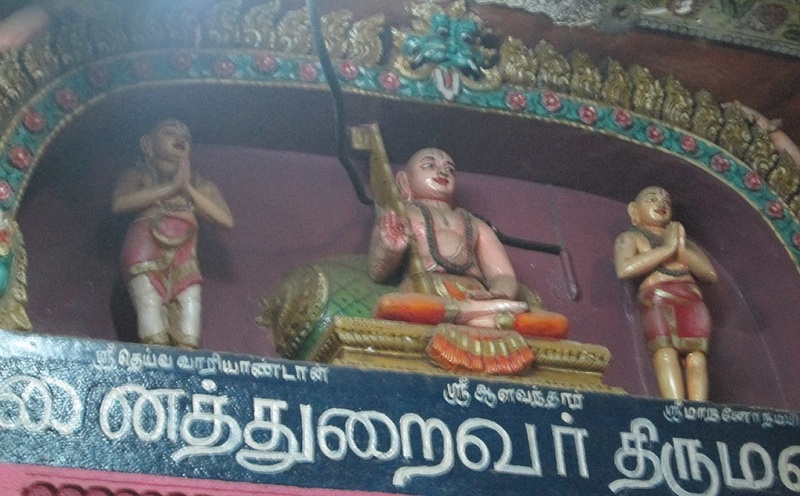 SrIvillipuththUr – periyAzhwAr thirunakshathra mahOthsavam day 4 (yesterday) – http://srivilliputhur.koyil.org/?p=508 . SrI rAmAnuja dharsanam – e-magazine – July/Ani – english Issue recently released and can be viewed at http://www.varavaramuni.com/home/sriramanuja-dharsanam-magazine/english . bhagavath gIthA – 2nd chapter, 4th and 5th SlOkams added in http://githa.koyil.org/index.php/chapter-2/ based on http://githa.koyil.org/index.php/chapter-2-original/ . SrIvaishNava granthams – thathva thrayam – chith (who am I?) – https://srivaishnavagranthamshindi.wordpress.com/2016/07/07/thathva-thrayam-chith-who-am-i/ based on http://ponnadi.blogspot.in/2013/03/thathva-thrayam-chith-who-am-i5631.html – Hindi translation by bhagavathi ammangar . Full series available at https://srivaishnavagranthamshindi.wordpress.com/thathva-thrayam/ . Commencement of thoNdaradippodi AzhwAr’s thirumAlai translation at http://divyaprabandham.koyil.org/index.php/2016/07/thirumalai/. English translation by T N krishNan swamy. yathirAja vimSathi SlOkam 20 – http://divyaprabandham.koyil.org/index.php/2016/07/yathiraja-vimsathi-hindi-20/ – Hindi translation by T S lakshminarasimhan swamy. Full series can be viewed at http://divyaprabandham.koyil.org/index.php/2016/03/yathiraja-vimsathi-hindi/ . With this the series comes to an end. SrIperumbUthUr – Ani pUsam (yesterday) – http://sriperumbuthur.blogspot.com/2016/07/july-2016-week-2.html . SrIvillipuththUr – periyAzhwAr thirunakshathra mahOthsavam day 3 (yesterday) – http://srivilliputhur.koyil.org/?p=508 . thiruvAimozhi 3.1.1 – mudichchOdhiyAy – http://divyaprabandham.koyil.org/index.php/2016/07/thiruvaimozhi-3-1-1-mudichchodhiyay/ – English translation. Full series can be viewed at http://divyaprabandham.koyil.org/index.php/thiruvaimozhi/ . rAmAnusa nURRanthAdhi pAsuram 29 – http://divyaprabandham.koyil.org/index.php/2016/07/ramanusa-nurranthadhi-29/ – English translation by raghurAm swamy. Full series can be viewed at http://divyaprabandham.koyil.org/index.php/2015/07/ramanusa-nurranthadhi/ . SrIperumbUthUr – Ani punarpUsam (yesterday) – http://sriperumbuthur.blogspot.com/2016/07/july-2016-week-2.html . SrIvillipuththUr – periyAzhwAr thirunakshathra mahOthsavam day 2 (yesterday) – http://srivilliputhur.koyil.org/?p=508 . guru paramaparai – aruLALap perumAL emperumAnAr – life and glories in thamizh – https://guruparamparaitamil.wordpress.com/2016/07/05/arulala-perumal-emperumanar/ based on http://guruparamparai.wordpress.com/2012/11/28/arulala-perumal-emperumanar/ – new article by SrIvaramangA ammangar and santhAnakrishNan swamy dhampathi . Please visit https://guruparamparaitamil.wordpress.com/2015/03/14/introduction-2/ to see the full list. dhivya prabandham – Commencement of thiruvAimozhi 3.1 decad – mudichchOdhi – http://divyaprabandham.koyil.org/index.php/2016/07/thiruvaimozhi-3-1-mudichchodhi/ – English translation. Full series can be viewed at http://divyaprabandham.koyil.org/index.php/thiruvaimozhi/ . Audio of this decad available at http://divyaprabandham.koyil.org/index.php/2016/07/thiruvaimozhi-3-1-audio/ . SrIperumbUthUr – Ani thiruvAdhirai (yesterday) – http://sriperumbuthur.blogspot.com/2016/07/july-2016-week-2.html . SrIvaishNava granthams – SrIvaishNava lakshaNam Part 13 (Conclusion) – https://srivaishnavagranthamshindi.wordpress.com/2016/07/04/srivaishnava-lakshanam-13/ based on https://ponnadi.blogspot.in/2012/08/srivaishnava-lakshanam-13.html – Hindi translation by jAnaki ammangar . Full series available at https://srivaishnavagranthamshindi.wordpress.com/srivaishnava-lakshanam/ . With this, the series is completed. We will prepare the e-book and upload it soon. dhivya prabandham – rAmAnusa nURRanthAdhi pAsuram 28 – http://divyaprabandham.koyil.org/index.php/2016/07/ramanusa-nurranthadhi-28/ – English translation by raghurAm swamy. Full series can be viewed at http://divyaprabandham.koyil.org/index.php/2015/07/ramanusa-nurranthadhi/ . SrIperumbUthUr – Ani mrgaSIrsham (yesterday) – http://sriperumbuthur.blogspot.com/2016/06/july-2016-week-1.html . Commencement of English translation for 3rd Centum at http://divyaprabandham.koyil.org/index.php/2016/07/thiruvaimozhi-3rd-centum/ . Full series can be viewed at http://divyaprabandham.koyil.org/index.php/thiruvaimozhi/ . yathirAja vimSathi SlOkams 15 to 19 – Hindi translation uploaded by T S lakshminarasimhan swamy. Full series can be viewed at http://divyaprabandham.koyil.org/index.php/2016/03/yathiraja-vimsathi-hindi/ . SrIperumbUthUr – Ani rOhiNi (yesterday) – http://sriperumbuthur.blogspot.com/2016/06/july-2016-week-1.html . SrIvaishNava granthams – SrIvaishNava lakshaNam Part 12 (mAmunigaL’s greatness) – https://srivaishnavagranthamshindi.wordpress.com/2016/07/02/srivaishnava-lakshanam-12/ based on http://ponnadi.blogspot.in/2012/08/srivaishnava-lakshanam-12.html – Hindi translation by kEshav swamy and jAnaki ammangar . Full series available at https://srivaishnavagranthamshindi.wordpress.com/srivaishnava-lakshanam/ . dhivya prabandham – thiruvAimozhi 2.10.11 – poruL enRu – http://divyaprabandham.koyil.org/index.php/2016/07/thiruvaimozhi-2-10-11-porul-enru/ – English translation. Full series can be viewed at http://divyaprabandham.koyil.org/index.php/thiruvaimozhi/ . With this second centum is completed. This entry was posted in Uncategorized on July 2, 2016 by Sarathy Thothathri.